Everyone wants their kitchen to be beautiful. After all, you don’t want to spend your hard earned money to create an ugly kitchen! However, in the journey to create this aesthetically pleasing space some homeowners forget about or sacrifice the functionality of their space. 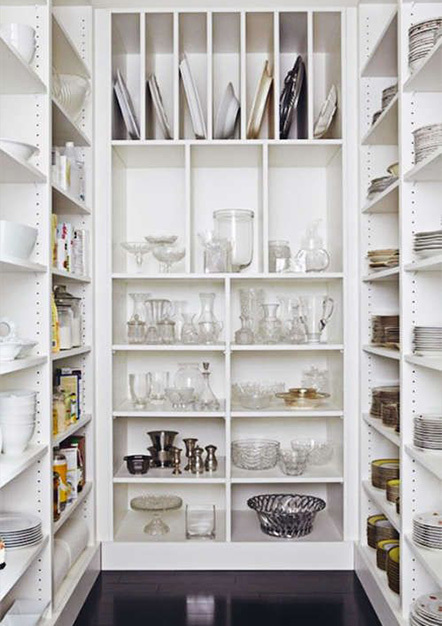 A prime example of storage and organization in a kitchen would be the pantry. The pantry has many different forms now, including the freestanding pantry, built-in pantry, walk-in pantry, cabinet pantry, and the butler’s pantry, which is still called that even though the majority of us no longer have a butler in this day and age. 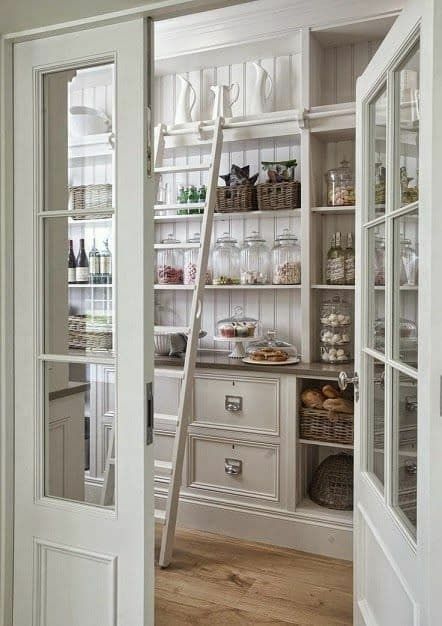 Unfortunately, not all of us have the space for the gorgeous pantries above and some do not have room for a pantry at all! This is when we have to get creative with our storage solutions elsewhere! In a kitchen with a limited amount of space for storage it is important to make the most of the space that you do have. 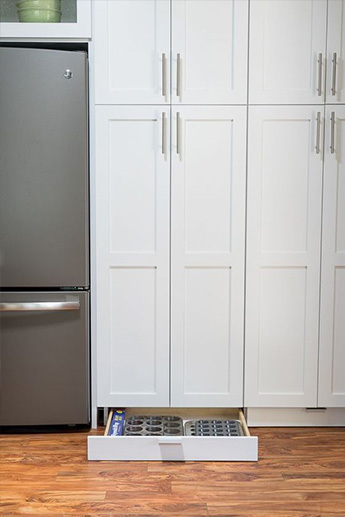 This can be done by being creative with space that isn’t normally used, such as the wasted space underneath the cabinet. 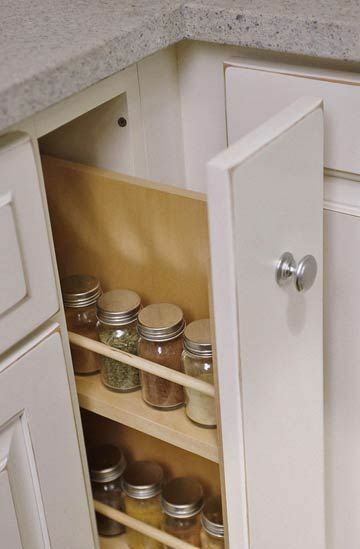 Or by making better use of one of the most difficult storage spaces in the kitchen; the corner. 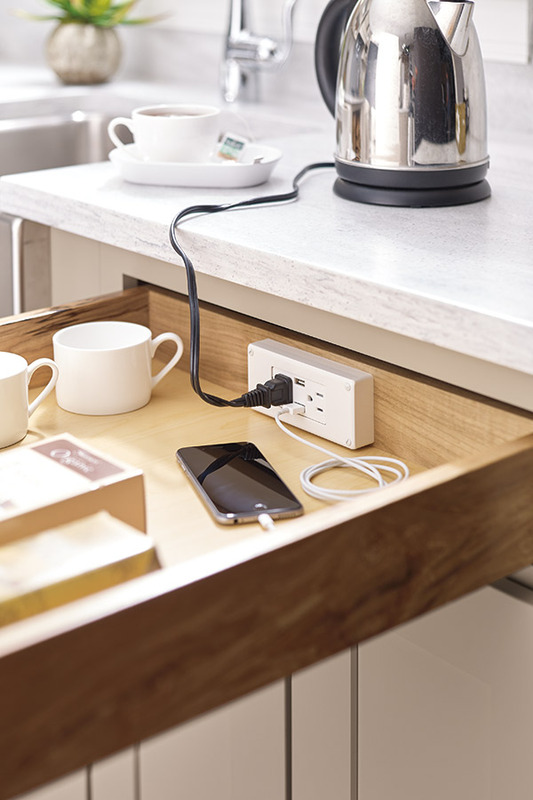 By using a corner drawer base you make the most out of that awkward corned by making it so much easier to access. With all the advancements that we have today it is no wonder that our kitchen’s would follow suit. There are so many different things that have been added to kitchen design in order to help make things more user friendly and functional. Fillers and dead space can now be turned into spice pullouts in order to make that space usable. 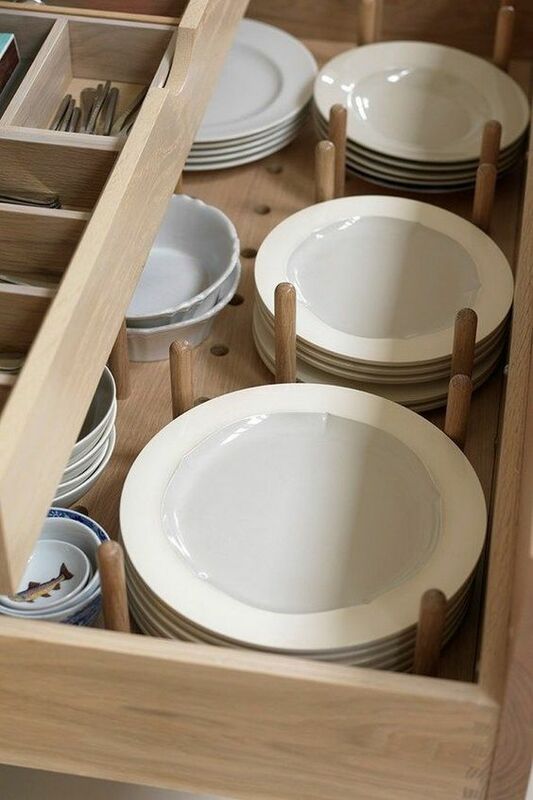 There are now inserts for drawers to better organize china and flatware, to get electronic devices off of the counter, to organize plastic containers, and to organize pots and pans. In terms of kitchen storage and organization we have come a long way. What are some of your favorite ideas? Let us know! 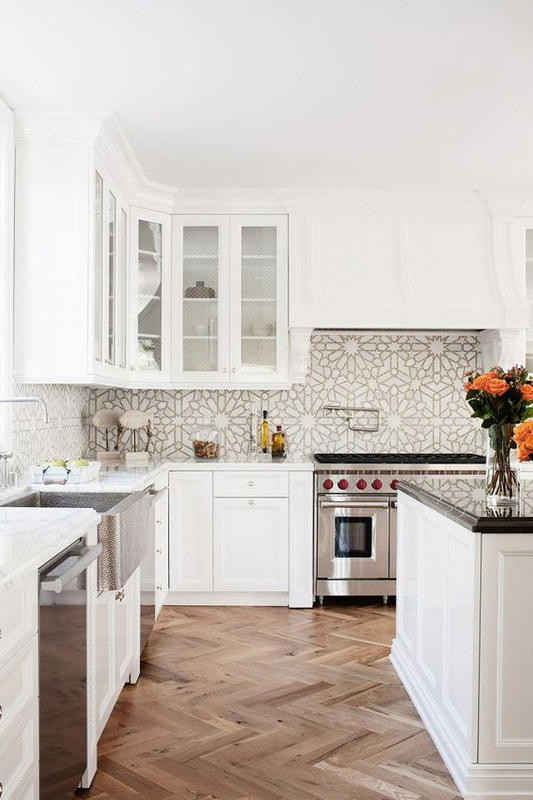 Patterned tile seems to be gaining popularity recently in the kitchen and bath industry. It is frequently used to make a dramatic statement in a space, but a more subtle pattern can be chosen to create the opposite effect. 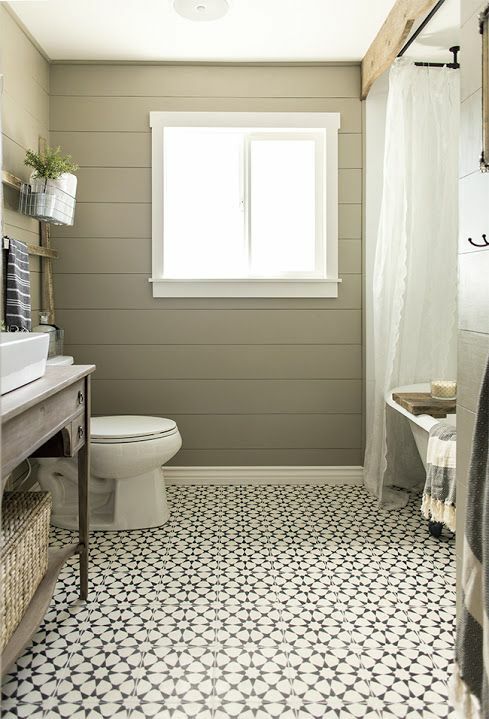 These tiles can be used on the walls, floors, in shower niches, or even shower benches to add some character and contrast to the space. The possibilities are endless with this new trend. It adds something new and interesting to what would normally be bland and boring. Above are some examples of where this is most commonly used. 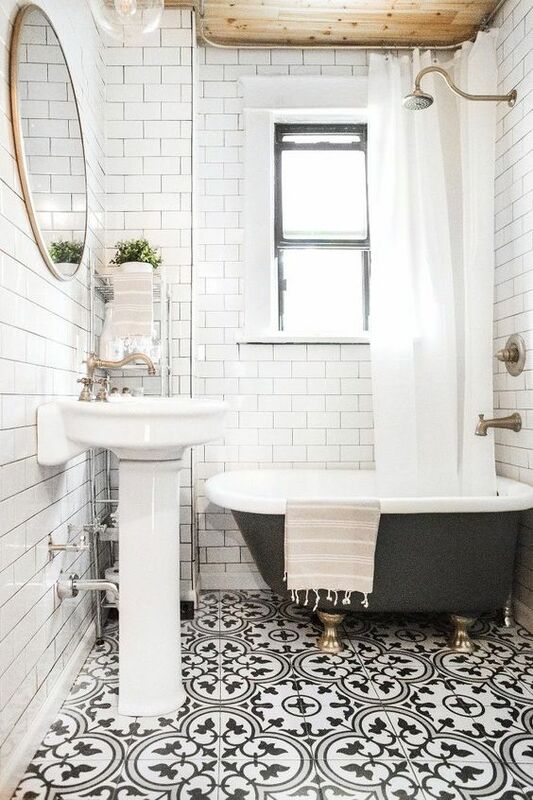 Because this tile is dramatic it is normally used in smaller spaces so that it does not become too overpowering in a room of a larger scale. 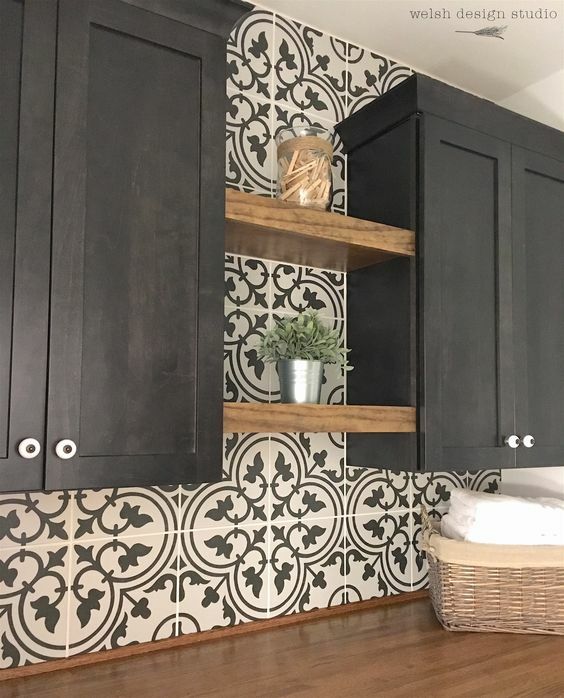 This is becoming more popular in the Industrial and Farmhouse design styles, but could be used in more Transitional spaces as well. The only thing to consider is if this will be a timeless look or if it will fade out of popularity inevitably. What an idea! What do you think of this new trend? Let us know! In the world today trends and styles are constantly changing right before our eyes. This sometimes leads to homeowners feeling confused and overwhelmed with the many possibilities of how their space can look and feel! These monthly posts will help people find inspiration for some of the most current trends and help to make them their own. The goal for everyone is to eventually turn this inspiration into reality by using the ideas in their own spaces. In this months post we will focus on some of the more re-occurring trends that we see as the professionals. The photo on the left is a prime example of the trends that we will be discussing. It has the majority of things that people are looking for when designing their ideal space. This is a trend that has been gaining popularity steadily. This is a great choice for people who are torn between multiple colors that they want to incorporate. In the kitchen to the right they opted to use different cabinet colors, as well as, different countertop colors. Most people choose to do one or the other, but this can be done successfully if the colors are similar. 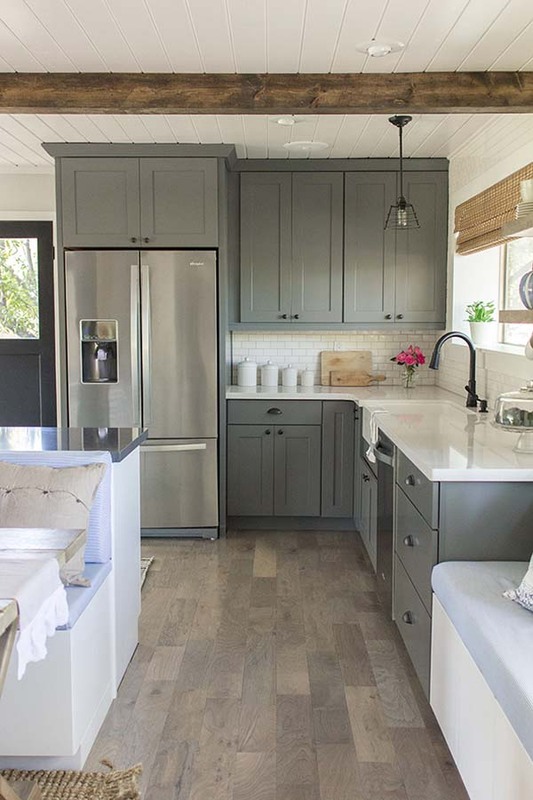 For example, in this kitchen they chose a gray cabinet with a white countertop for the perimeter and a white cabinet with a gray countertop for the island. It also helps if the countertops have a similar pattern that can bring in some consistency. This can be a very dramatic design choice or it can be something that is a bit more subtle. The style and look that you are trying to achieve will normally determine which end of the spectrum you will be at! 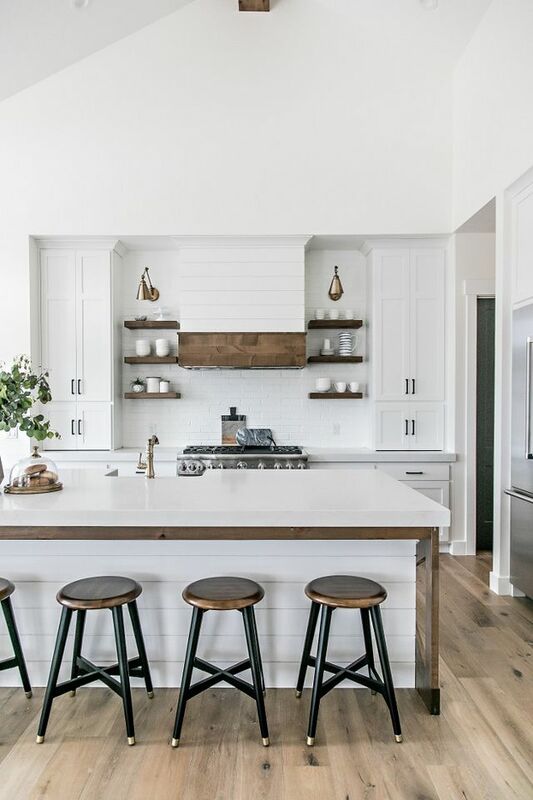 A second trend that has appeared lately is a kitchen with wood accents. 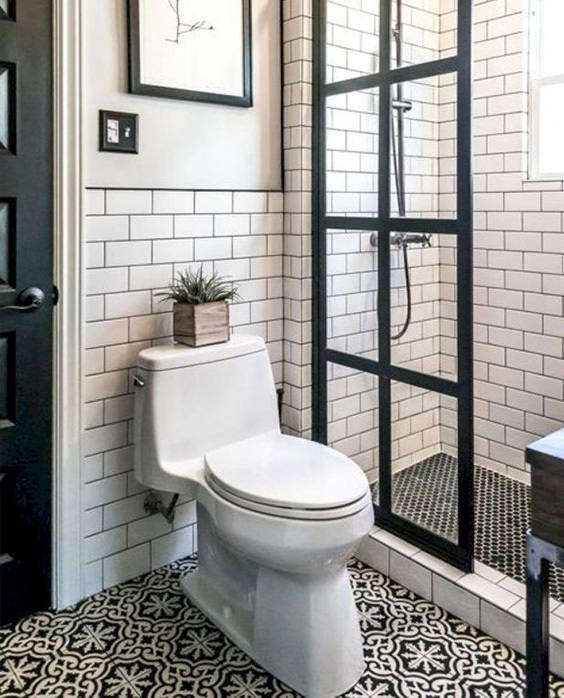 This may be because of the “Fixer Upper” fad, but the idea itself does have merit. It brings in a more subtle contrast than the previous idea. It is also a much more natural look that easily lends itself to a wide array of styles. This is most commonly done with the hood or open shelving, such as what is shown in the photo on the left. But can also be done with molding, paneling, and other decorative accents. 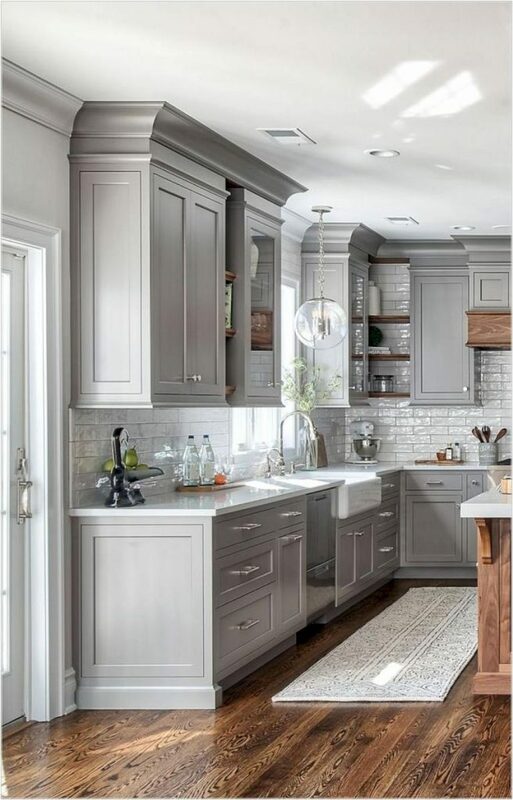 This is a much more calming, neutral look for the homeowner that wants a change and is worried about the trend losing popularity and becoming no better than the shag carpet and pastel color schemes. Although, we are starting to see a revival of some of the old trends so you never know what will happen in the future. Lastly, the concept of open shelving has become popular, as well as, practical. 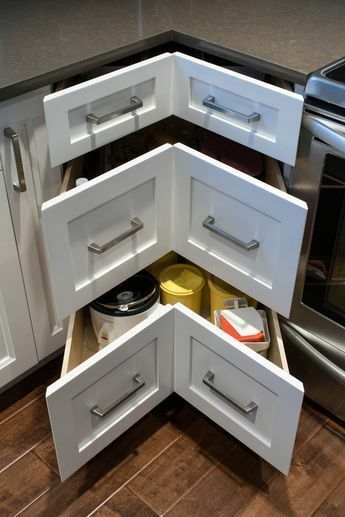 They are most commonly used in areas of the kitchen that are normally challenging to place normal cabinets, or in areas that are considered wasted space. This can be seen in many of the photos in this post. For example, in the photo on the left they are making use of a hard to reach corner by using the open shelving as display space. This makes it useful aesthetically instead of functionally. 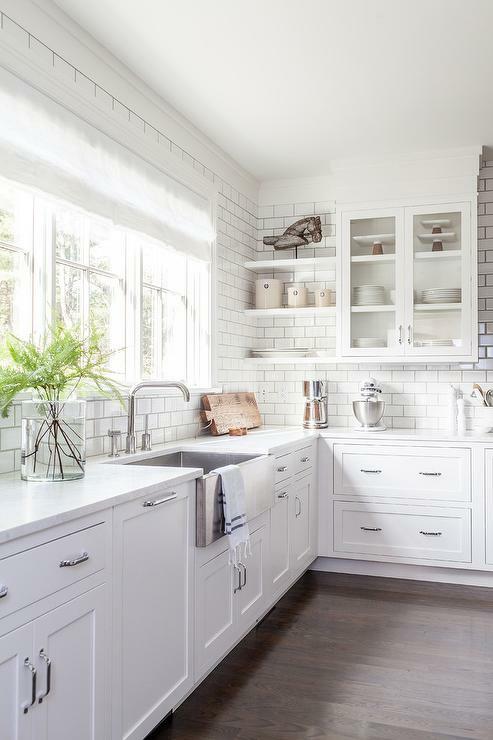 This example shows the shelving continuing the all-white theme that seems to be predominate in this kitchen, but it is also common to have the shelving contrast for a pop of color in a very monochromatic space.